Manufactured to fit within our own branded sign holders, these Gompels Cross Contamination/Colour Coding Sign A5 are a smart identification method for busy environments. The 350gsm paper signs have been sized at a compact A5 size that slips in easily with other information on your display boards and have been laminated for extra protection. 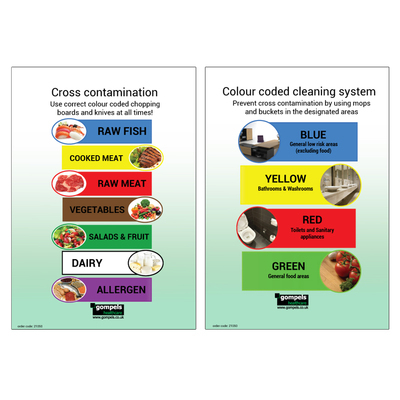 Place your colour coding sign in food preparation areas or cleaning cupboards to ensure every colleague understands the correct coloured tools to use for every single task. These signs are designed to fit inside either our Black Sign Holder A5. Here at Gompels, we have a wide range of Signage options from our No Smoking / No Mobiles options through to First Aid and COSHH Regulation options.